Once you sign up for Zoho Recruit and have your own account, you can personalize your Recruit account. By default, the mandatory information provided by you at the time of sign up, is automatically updated. After logging in, you can change these details according to your preferences. You can change your personal details such as name, phone number, website, date of birth, address, language, time format, time zone, etc. Go to Setup > General > Personal Settings. In the Personal Settings page, click Edit icon for the corresponding section. 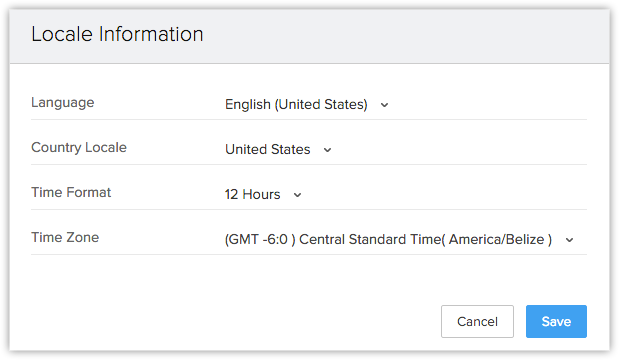 To change language, country locale, time format and time zone. In the Personal Settings page, click Edit icon for the Locale Information section. Choose the value from the corresponding drop-down lists. By default, the name format is set as <Salutation><First Name><Last Name>. However, you can change the name format as per naming conventions used in your country. 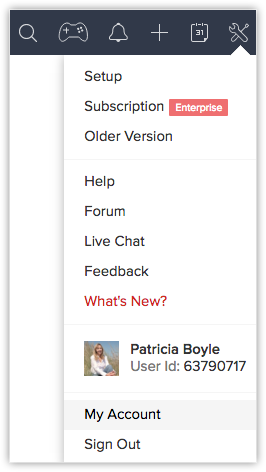 Under Name Format section, drag and drop the Salutation, First Name and Last Name to change the order. Zoho provides Single Sign on service, and so if you change password for Zoho Recruit, it will be changed for all Zoho Services. You can change password from Zoho Accounts. Please note that you cannot change password for other users. Click Settings icon and then click My Account. In the Zoho Accounts page, click Security. In the Password page, enter your Current Password and New Password in the corresponding fields. The New Password gets updated and should be used to sign in to all Zoho Services. While sending emails to your customers, you can embed a signature automatically in the body of the message. Signatures can be customized as per your requirements. Specify the signature in the HTML editor. To use the signature in emails, you need to enable the Add User Signature check box in the email template. You can also add a logo in your signature by providing the image source in the HTML code. In the editor pop-up box, click to select an image and insert.